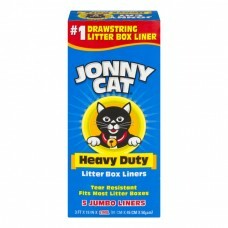 Jonny Cat® Heavy Duty Litter Box Liners. #1 Drawstring Litter Box Liner. Tear Resistant Fits Most Litter Boxes. Jumbo Liners. 3 ft x 18 in x 2 mil (91 cm x 45cm x 50µm). Easy cleanup! For Questions or Comments, Call 1-800-645-3741. Visit our website at www.jonnycat.com. © 2009. 1. Take on liner from package and fit into bottom of litter box, folding edges of liner over the sides. 2. Fill clean litter box liner with approximately 3 inches of Jonny cat® cat litter. 3. For easy clean-up, pull drawstrings on both sides of bag to close. 4. Dispose of liner and contents with your regular garbage.